Today, we again get to hear from that mysterious man of the Tin Pan Alley label, "Lance", whose name is always printed with quotes. 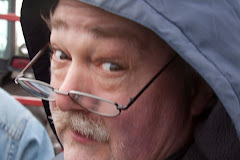 We last heard from "Lance" when in March of 2010, when he was heard singing about the "Hat Me Father Wore". Today, he's telling a fairly incomprehensible story, involving the acquisition of two important categories of possessions, "Fine Cars, Fine Cigars". 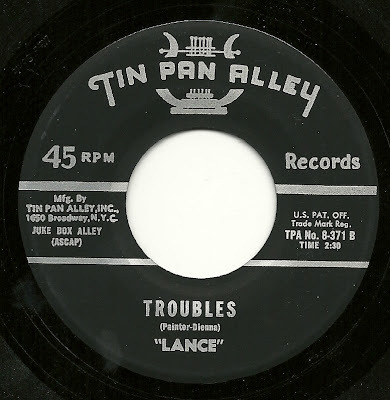 And this record brings up an interesting question, that being whether anyone involved in the making of Tin Pan Alley records in the mid 1960's was competent at their jobs. At different points on this record (both sides), the guitar player misses easy chords (and how about those solos? ), the bass player appears confused as to what song they're playing, and the drummer seems challenged by his assignment which (on the A-side) is mostly to hit the snare drum on the off beats. 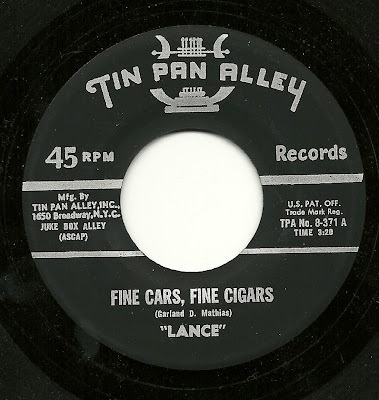 And "Lance" repeatedly demonstrates very poor ability as a singer - as an added bonus, if you listen closely, you can hear "Lance" clear his throat at about the 2:04 point. The title of the flip side of the record, "Troubles", could likely be a description of the goings-on during the recording session for this single. Amazingly, one second into the track, the bass player either plays a note completely by accident, or at best, plays the wrong note, and it's downhill from there - the bass being out of tune doesn't help, nor does a remarkably poorly played organ. There also seems to be an inadvertent (or poorly executed) edit around the 1:47 mark (that's not a file error, that's how the record plays). 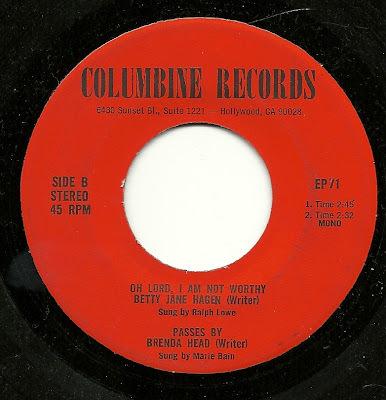 Nearly two and a half years into this project, and it's taken me until now to feature a record on the giant Columbine label. There are a few reasons for this, but the two biggest are: First, that Columbine primarily released albums, which I don't generally sample here, and second, I'm not a fan of their typical sound, or of the singing style of most of their singers. 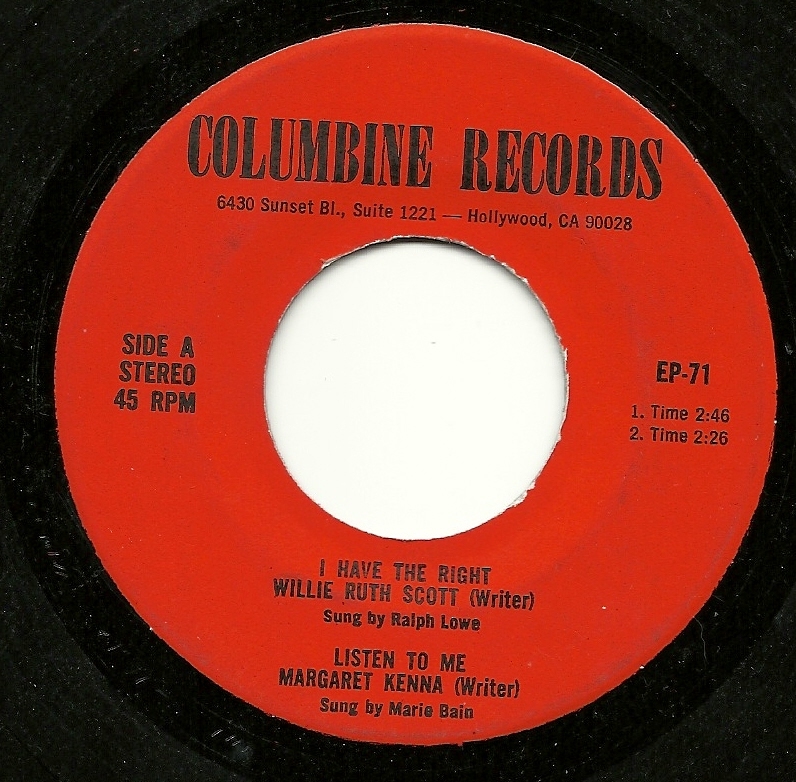 Although Gene Marshall made some Columbine releases (under the name John Muir), they released many more records featuring Ralph Lowe, for whom the word "unctuous" could well have been coined, and Kay Weaver, who is a genuinely terrible singer. But today's EP is worth sharing, for a couple of reasons. The main one is that the lead track, "I Have the Right", featuring Ralph Lowe, contains some lyrics which manage to be both spectacularly pedestrian AND logically baffling. The songwriter in question apparently believes that the fact that one has the ability to engage in a variety of free, open activities, which do nothing to disturb anyone or anything, means that one also is entitled to have his or her feelings returned, from the object of affection. Seriously: because "I have the right to walk the narrowest trail" (ooh, pinch me), it follows that "you have no grounds to protest my affection, you have no grounds to hurt me"? Really? Next up is the otherwise unknown Linda Bain (who is a terrible enough singer that I wonder if this isn't actually Kay Weaver), singing a piece of fluff titled "Listen to Me". 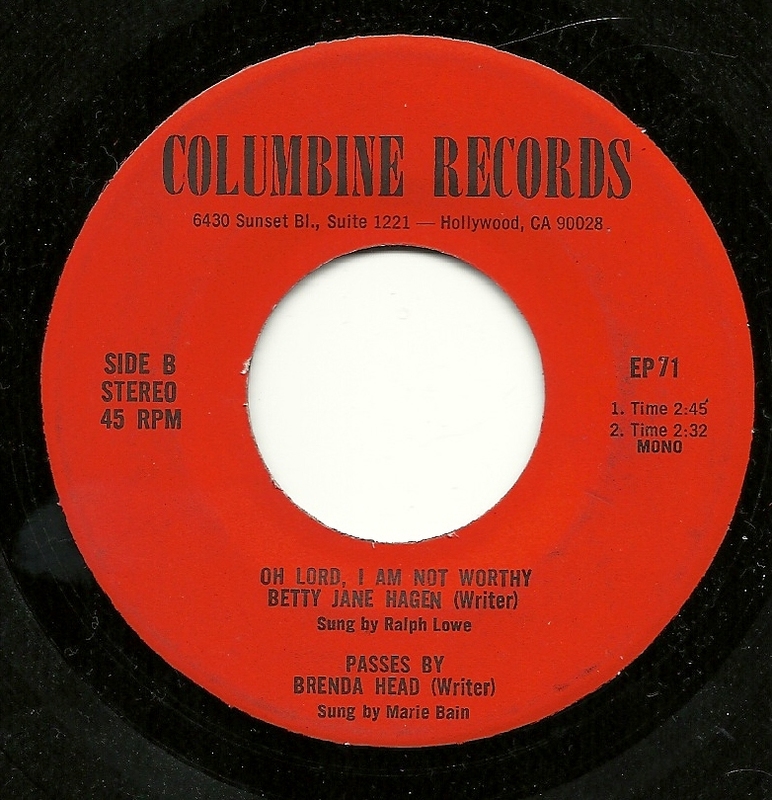 After three weeks of specialty, seasonal related posts, I thought it would be a good idea to get back to something more mainstream, and for better or worse, few song-poem labels attempted to be more mainstream than Preview. 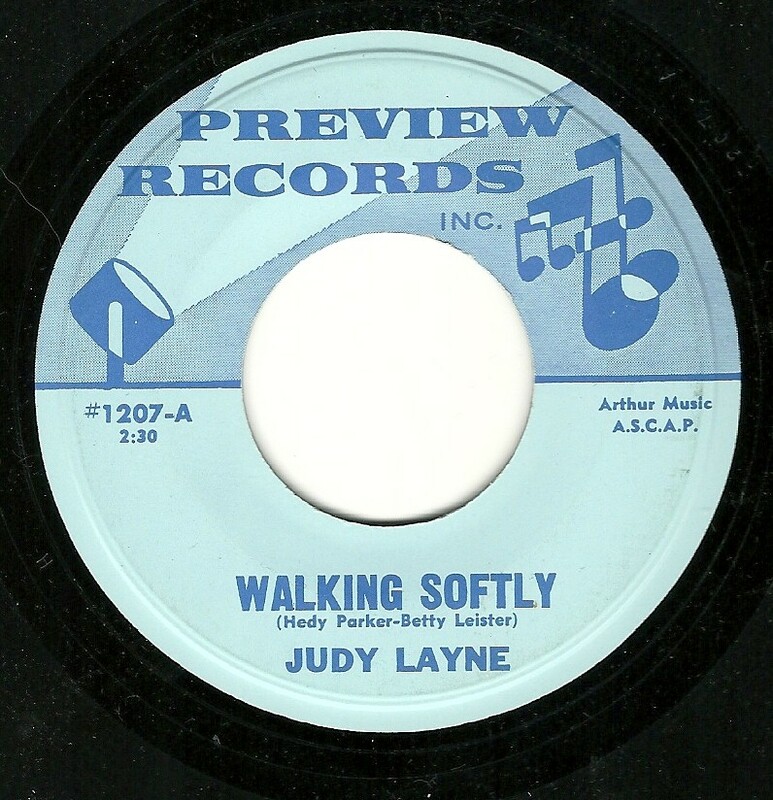 Judy Layne's name is one that appears rarely on the Preview label, appearing on roughly two dozen documented singles, all but one of them on the earliest set of records on the label (circa 1966-67). Here's one of those low-numbered releases, featuring a track that has all the hallmarks of a Rodd Keith production, and a mighty nice little pop confection it is. All, that is, except for the less than appealing vocals of the aforementioned Ms. Layne, who I find whiny and almost shrill. And yet, "California Moon" (written by the wonderfully named Estalla Beachboard) is still a fairly nice listen. 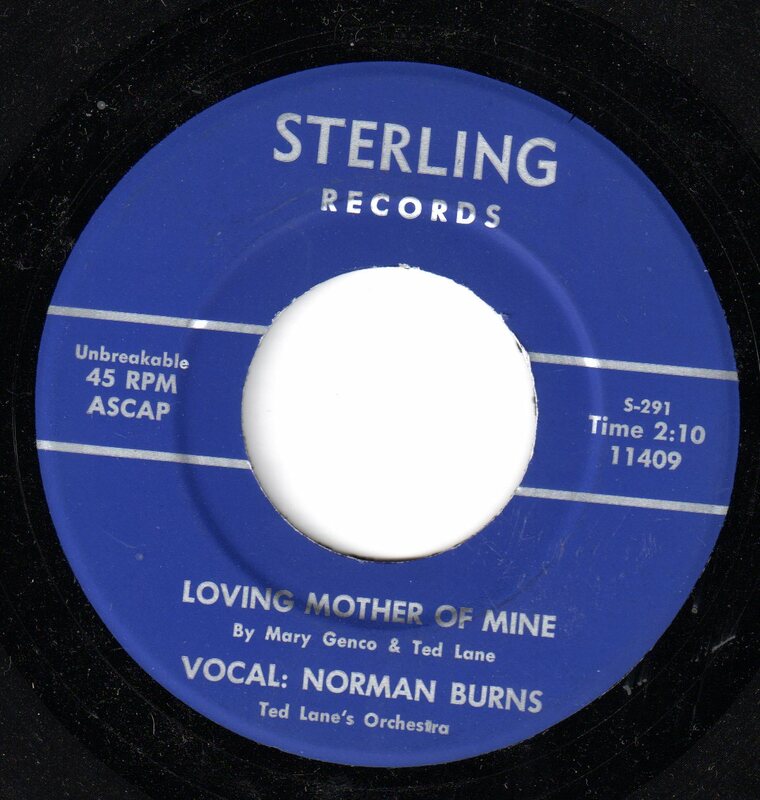 Today's post is a special feature for Mother's Day, featuring Mrs. Burns favorite son, Norm (or Norman, as he was sometimes billed, including on today's record), singing "Loving Mother of Mine". For song-poem watchers out there, this Sterling release is interesting for a couple of reasons. 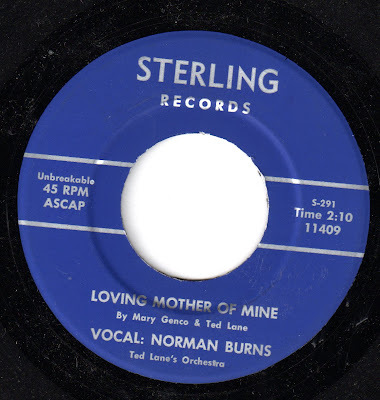 First, although the backing track doesn't really sound out of the ordinary for a Sterling release, it is credited to "Ted Lane's Orchestra", the only record on this, or any other song-poem release where I've seen this billing. Ted Lane is also a co-writer on both sides of the single. 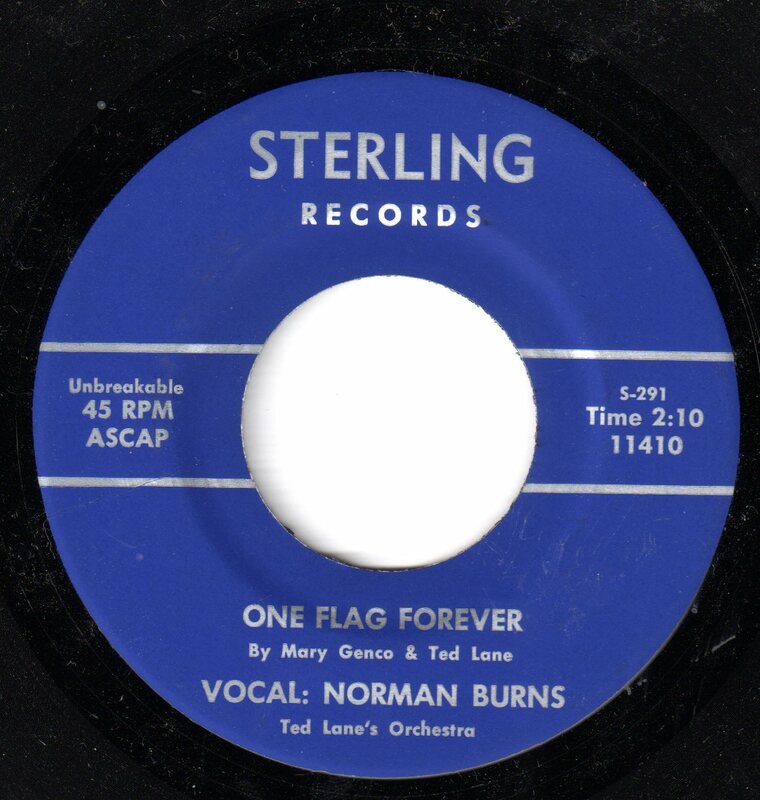 In addition, this is Sterling records # 291. 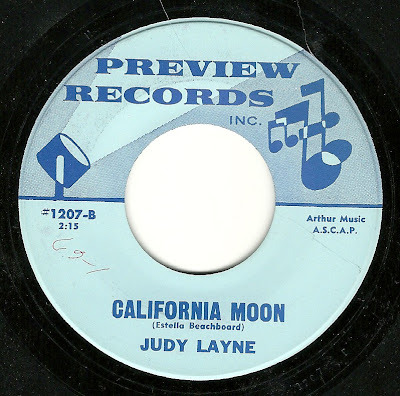 There is a listing for this label number at the song-poem website's Sterling page, but it's not this record, and that website also shows no listings for any records released featuring anyone named Ted Lane. Also, the times listed on each side of this record (identical listings of two minutes, ten seconds) bear no resemblence to the actual length of either side.